I have always enjoyed Dole fruit products, so I was expecting good quality and great taste when I gave Dole Fruit Parfaits a try recently. What I wasn't prepared for was the stick my finger in the cup to get every last drop of goodness out taste! Readers, be warned: you will want to stock up on all three flavors of the Dole Fruit Parfaits. At just $2.79 per 4 cup package, it won’t break your budget to do so. Dole Fruit Parfaits are available in three flavors: Pineapple and Crème, Apples and Crème, Peaches and Crème. Each parfait package contains 4 grab and go clear cups with easy peel off lids (so your kids can open them by themselves). This is a plus for me because some fruit cups lids are hard to open, leading to big messes, even for my bigger kids. 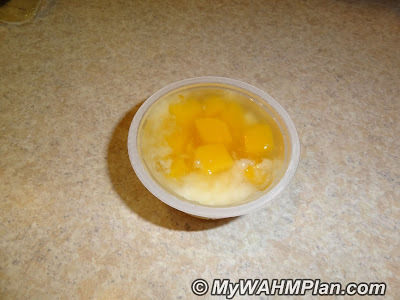 Another plus is that Dole Fruit Parfaits contain all natural fruit with Vitamin C, are low in fat and sodium and cholesterol free. And they score high marks on keeping calories low. The Peaches and Crème cup and the Pineapple and Crème cup have 120 calories per serving and the Apples and Crème has 130 calories per serving. Please visit www.dole.com for more information. I love them! My kids love them! My husband loves them! Seriously. 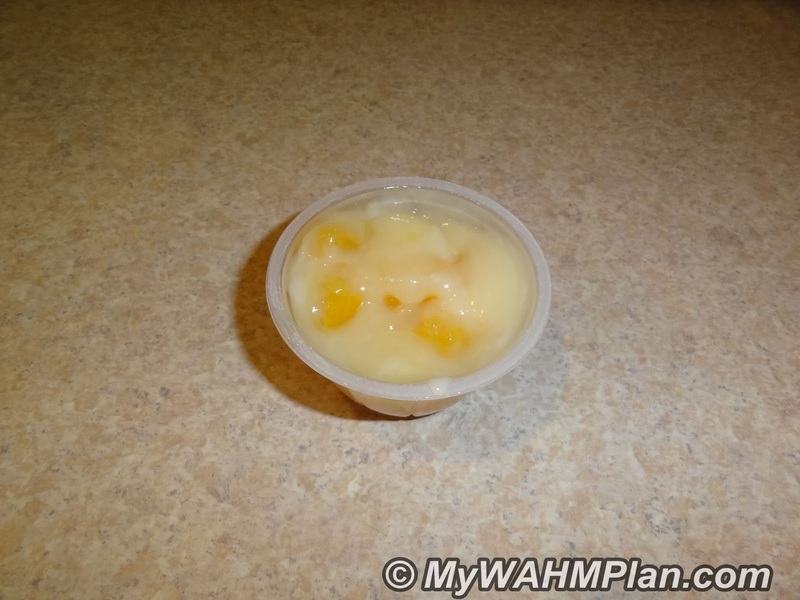 I have never been able to give a 4 point Love to a product before here on My WAHM Plan, but these fruit Parfaits deserve it. We have tried all 3 flavors and found them to be a refreshing treat. None of us had a clear favorite. All 3 flavors will be bought again! The fruit is naturally sweet, like we have come to expect with Dole fruit and the crème is light-tasting, not heavy. You can serve these parfaits room temperature, cold, or add them to warm cereals like oatmeal for a quick and easy way to dress up a morning staple. Dole Fruit Parfaits are a snack we can feel good about giving our whole family. You can learn more about Dole Fruit Parfaits by visiting their website HERE, liking them on Facebook and following them on Twitter. I hope you found this review helpful. Do you have a favorite Dole Fruit product? Please share! Disclosure I am part of the Mom It Forward blogger network. Mom It Forward and DOLE partnered in support of this campaign. DOLE compensated me for participation in this campaign. However, all thoughts and opinions are my own. Oh my goodness! Those look so yummy!!! ALL of my kids love these fruit cups but we've never tried this one. Thanks for the info! Yummy and something I would love to serve to my little ones. I need to try this out. Things with gel kind of creep me out lol. I don't know why, it's just one of those food things! I can't stand gummies! I know, I'm weird. But I do love Dole! I warned you. :) They are so good!Go get some, your mouth will thank you! Your kids are gonna love these! So glad my review was helpful. Thanks for stopping by. I understand completely, it's a texture thing. These fruit cups aren't gel like at all. More like fruit you poured creme over. You might enjoy them better if you didn't mix them up and just ate them as is. Oh, these cups would make a great treat for your little ones. Serve them and get some happy smiles! You won't be disappointed! These parfaits are so good. We can't choose a favorite. There is one left in the pantry and everybody is being polite and not snagging it for their own, so I will have to buy more soon. I wondered if these were good! Thanks for sharing.